Mark Vermeij has over 20 years of experience at Cargill in oil refining. When he was recruited to join PFS in order to provide support to Jackma Enterprises, a food oil producer in Tanzania, on the construction of their food oil refinery, Mark was working in Cargill’s Center of Excellence for refined oil. “Jackma was not familiar with the technology, neither the process of the refining oil or how to manage quality control. In Tanzania, there are specification that refined oil has to meet so I started helping them to understand how to update their practices to create quality oil that meets these standards,” said Mark. Mark played an integral role by offering technical support to Jackma, answering questions that came up as the processor began constructing their oil refinery. When the newly purchased refinery machinery did not come with a manual, Mark utilized his connections internationally at Cargill to get the necessary information on the machinery from the supplier in India. With this information, Jackma was able to expedite the construction of the oil refinery. Mark was also quick to admit that he also acquired key knowledge from his time working with Jackma. “For me, the most valuable piece was learning about the context that these processors are working in. These experiences open your eyes to how business is done in various parts of the world and I put all of those experiences in my backpack so when I’m talking to managers at Cargill about expected complications during construction or the timeline when we build in different countries, I have a frame of reference that informs my decisions,” he said. “It’s gratifying to support these entrepreneurs and see the difference our work can make,” says Sam Whitney, a continuous improvement manager at DSM. One thing that he loves about his three plus years of volunteering with PFS is that the work that they do for one client can have an exponential impact by being shared with others. One example of that impact is a fortification training program that Sam and a team of other volunteers developed for workers at three companies in Tanzania - Kilonda, Katundu and Chamwino. The training explained the causes and consequences of malnutrition, the role vitamins play in our bodies, food fortification and dosifiers. He says that it’s important for employees to understand not just how to fortify flour, but also why food is fortified because that information will be shared throughout the larger community and create awareness of, and demand for, fortified foods. In September, something unique happened in Lausanne, Switzerland. Forty people, from nine countries, on three continents, representing eight organizations, came together for the first time at the first ever PFS European Volunteer Summit. 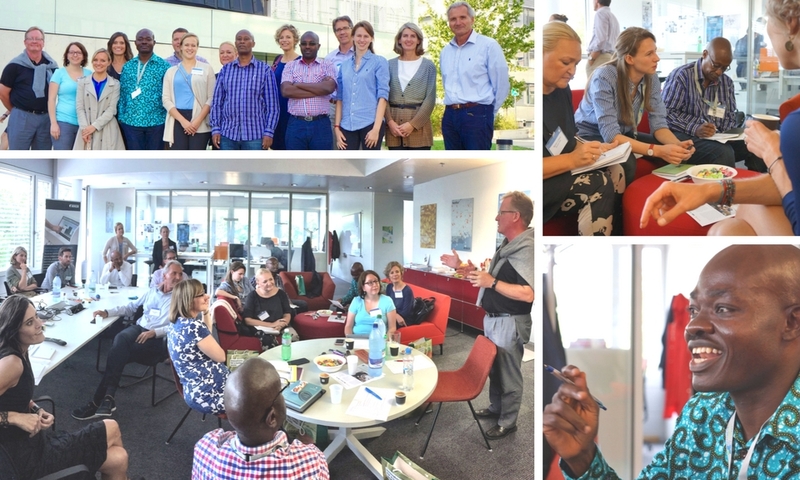 Over two days this remarkable group of volunteers representing each of our partners, and PFS staff from Africa and the U.S., worked together to develop ideas on engaging new volunteers in Europe. They learned from our three African-based food techs about what they are hearing from client companies in East and West Africa, and introduced the food techs to the vast amount of world-class expertise available among our partners in Europe. I left the summit inspired by stories, improved through honest dialogue, challenged by creative ideas, and confident that PFS has a cadre of empowered ambassadors ready to lead our nearly 150 talented European volunteers. We were graciously hosted by Bühler at their innovation space in École Polytechnique Fédérale de Lausanne. Like the others at the summit, I experienced firsthand the creative and entrepreneurial thinking that this open and collaborative space is designed to foster. For many of us, it was the first time that we had met in person, including some people that had come from the same company. The venue offered the perfect setting for our three African field staff in attendance to intimately discuss stories from the field with European colleagues. I watched as volunteers’ eyes lit up when Christian Dedzo, our program manager in Ghana, shared a story of how he identified his first client by walking through a supermarket and looking for products that he thought could use improved nutritional content or branding. Volunteers shared with field staff how important pictures and videos are when they are working with clients that are thousands of miles away. While the PFS’ remote model enables us to scale our approach and reach hundreds of clients, we all truly enjoyed the rare opportunity to be together in person. As the summit concluded, I heard a number of ways that we can bring the PFS experience to life and adapt our approach for European cultures including better integration into a companies’ HR initiatives, and better communicating partner company leadership’s support for PFS volunteers. Along with all of the fun and productive activities of the summit, I also had the chance to visit Bühler, DSM, and Cereal Partners Worldwide facilities throughout Switzerland and the Netherlands. While our time together was brief, I know that what we have learned and shared will pay dividends in growth and engagement throughout Europe. In the coming year, I will be working with our team to implement the new ideas and action plans. Much like the other participants, I left the events energized, with a renewed focus on recruiting more European experts to empower African entrepreneurs, and enlivening their experience along the way. If you are interested in joining our growing community in Europe that is focused on strengthening food security, nutrition, and economic development in Africa, please reach out to me at jimmy@partnersinfoodsolutions.com or Rebecca Chou rebecca@partnersinfoodsolutions.com. PFS Volunteers from General Mills - Steve Berger, Mike Marshak and Kara Hobart -completed the Micronutrient Equipment Procurement Project in Ethiopia in early August 2017. The installations, commissioning and training at all five Bühler processors were finalized on July 28, well ahead of schedule. The five processors are Echa Food Complex, Admas Tesfa PLC, Dire Dawa Food Complex, Tigray Flour and Abat & Mehari. According to TechnoServe's Abel Ahmed, the processors are very pleased with the micro dosing units. They all recognize the Bühler name and are happy to have this equipment in their facilities. In addition, the processors are also excited to have lab balances and moisture testers. They were not aware this was included in the scope and are grateful to have this new capability. Still no update on the release of guidelines from the Ethiopian Government, but when that occurs, these companies will be ready. The royal blue walls of Doinyo Lessos Creameries, with the words “MILK” splashed in giant, white glistening letters rises up to meet visitors. In stark contrast to the muddy brown streaked walls of the neighborhood, the newly painted compound feels fresh, clean and orderly. Doinyo Lessos Creameries is in Eldoret, Kenya, the heart of dairy country in the western Rift Valley. Billing itself as the ‘Kenya’s oldest creamery’, the company collects milk from local farmers to produce cheese, ice cream, yogurt and fresh/tinned milk and ghee. Inside, we find the co-owners, Rosemary and Brian Cuthbert, finishing up their morning meetings. When Brian and Rosemary took over management in 2011, they knew they would need to standardize their practices in order to grow. In 2013, a local government contact introduced them to Partners in Food Solutions (PFS). Together, they focused on projects around strategic planning, improving their financial management systems and enhancing their quality assurance policies and processes. At first, it was challenging to right-size the solutions. “Everyone we’ve worked with knows their stuff,” explained Bryan, “But there was a gap between what they wanted and what we could do.” In the end, they focused on breaking down issues into discreet steps that could be implemented as resources became available. Doinyo was already on their way to hiring a quality assurance manager, but the volunteer recommendations spurred them into action. After making sure each one of us donned a white lab coat, covered our hair and removed our jewelry, Esther Kerigo, the quality assurance manager, proudly showed us around processing facility. Standard operating procedures for health and hygiene were clearly posted; boot baths are installed outside each processing area and toilet facilities had just been upgraded. The storage warehouse, she admits, still needed a bit of help, but all staff had been trained in good manufacturing practices, so it was only a matter of time before it was tackled. Watch a video profile of Doinyo Lessos HERE.